So I have spent the past couple of days attempting to install Windows 8.1 onto a MBP with High Sierra. Apparently, this model is unable to create and boot from a USB dive. So the normal Boot Camp method is out of the question. I've been following a guide posted on this site that uses VirtualBox to install Windows without the need for a USB drive or even a DVD. Here's the guide for reference: Is it possible to Bootcamp Windows 8.1 using USB on Late 2011 MBP? Created a new VM with Windows 8.1 as the version. I did not add a virtual drive. Using the Terminal, I found that the internal disk, disk0, had 4 partitions. I had created a WINDOWS partition, identified as disk0s4 when using diskutil list. in a Terminal application window. So far so good. No issues here besides having to disable the SIP in order to create the VMDK file. Back to the VM I created early, I when to the settings and clicked on the "+" sign by the SATA controller. I added the VMDK file that I just made so it appeared below the SATA controller. This is where I had to improvise. The guide asks to click on "Empty" below the IDE controller... except there was not IDE controller listed. Instead, there was another "Empty" shown under the SATA controller. So, I added a virtual disk (The Windows 8.1 ISO file) and checked in the "Live CD/DVD" option. So now what? I know the ISO file is fine because I have used it before to reinstall Windows. Is there a setting I missed? Ignore the message. You do want to select Custom: Install Windows only (advanced). See image below. The answer you are referencing was posted Jun 11 2015. This answer is basically the same as the earlier answer I posed on Apr 9 2015, except for a few omitted steps. The procedure you used might work provided a BIOS booting operating system was previous installed on your Mac. The answers I posted here and here were tested for Windows 7 and/or Windows 10, but not for Windows 8 or Windows 8.1. You might consider trying one of my posted answers. In any case, the Window Support Software for your Mac should be downloaded by using the Boot Camp Assistant installed on your Mac or directly from the website Boot Camp Support Software 5.1.5621. This software should be used with any 64 bit of version Windows you install (including Windows 10). 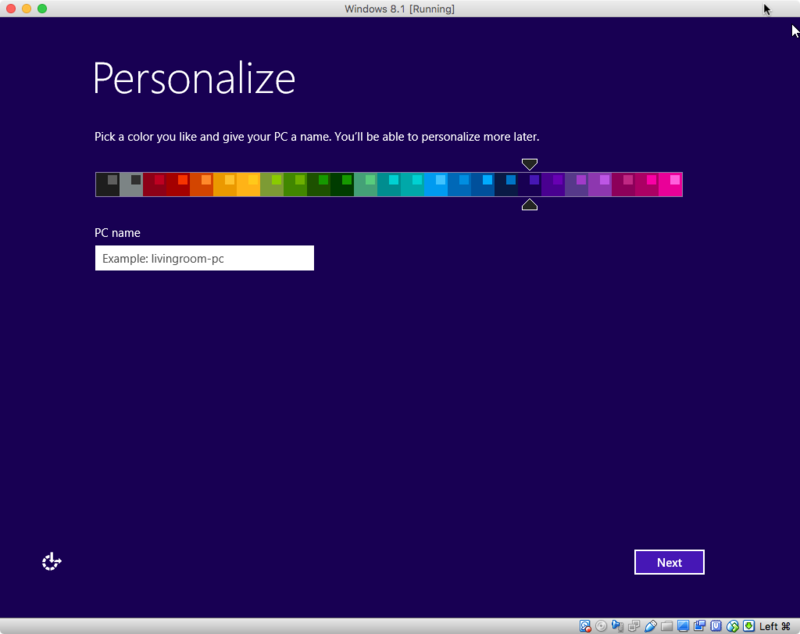 BTW: You and download and try Windows 10 without having a Product Key. Use Safari to download the Windows 10 ISO from this Microsoft website. You can buy a license after installing and testing Windows 10. I would recommend installing Windows 10 using the method given in this answer. The same procedure can be used with Windows 8.1. I tested by downloading 64 bit Windows 8.1 Pro from this Microsoft website. The file was named Win8.1_English_x64.iso. 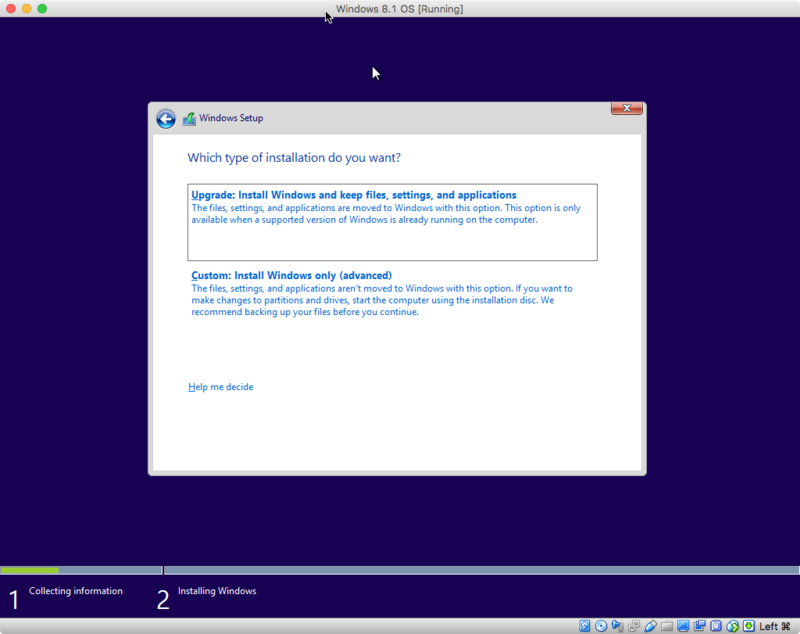 I used a Windows 8 Pro Product Key to install. The only significant change to the instructions would be the image below should be substituted for the images in step 18. Not the answer you're looking for? Browse other questions tagged bootcamp high-sierra virtualbox dual-boot windows-8 .